It's All About Books: The Sunday Salon: Happy New Year! Hey everyone! Happy New Year! I hope you have many wonderful things to look forward to this year. It's been a year since I started doing this journal-y Sunday post and it seems to be a good thing, so I think I'll keep it up. Outside my window: It's smack in the middle of the day on Sunday! That is new! We have early church this year, which means I'll have the whole afternoon to, you know, hang out. The past week has been beautiful, speaking of outside my window, and it's blue and sunny and clear and cold. But still, I'd like some snow please. I am listening to: Pandora... on my newly created Jonsi station. That's because Jonsi did the soundtrack for We Bought a Zoo and I was intrigued. It's very mellow, strangely hypnotic type music. I have no better description. Let's see. I'm hoping there's an episode of Once Upon a Time on tonight. Anyone know? And I watched the first episode of Revenge awhile back and I think I'd like to watch another one. We got Supernatural season 1 on DVD for Christmas and my daughter took that over and went ballistic. She has now way passed me up! Books I've finished: This week I finished The Iron Daughter and Torment, both good and interesting for the most part. Books I've started: I got Delirium from the library and yes have started it! Books I want to start: The Wise Man's Fear is going to be next, I swear it is! 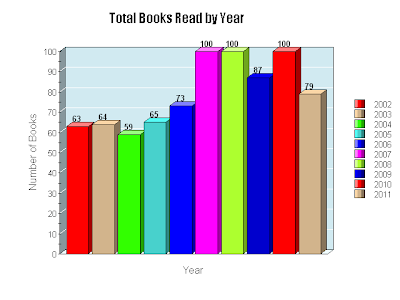 Oh, and hey, I copied a lot of people and did a graph of my reading over the years. Want to see? Can you guess what year I started book blogging? You'd think that all that blogging and reading blogs would have taken away time from reading books, right? Strange how that doesn't really work that way. Man, I wish I could see what the previous decade of the 90s would look like graphed out like this! I would guess I was reading maybe 40 or so books a year... maybe 30. Gosh, I have no idea. But I do know that when I started keeping track in 2002, I thought I was really revving up the reading then. I am thinking: that I better get going on Inheritance and Path of Daggers before I totally forget I was even reading them. I'm also thinking that I want to see War Horse before the holidays are officially over... that leaves tomorrow. I am grateful for: the end of one year and the beginning of another, though it always makes me sad a little, and nervous a little. What I learned this week: that two weeks of a "doing nothing" vacation is just a touch too long. Around the house: it's one huge mess! I did put away Christmas gifts, but the decor has not gone yet. And it's still very much cluttered and lived in and there's no way to get a handle on that until everyone goes back to school. Recipe of the week: Not much cooking going on around here this week. Family matters: Kid #1 is supposed to move out tomorrow. He's feeling a bit leery suddenly. He's also sick and I hope we all don't get it. Kid #2 starts back to college on Wed. so she will move back either tomorrow or Tuesday too. It will seem weird without them so suddenly. Kids 3 and 4 start back on Tuesday, but with weird schedules for a week. I hope we figure it out without too much stress. It's going to be an interesting week trying to get them up and make them go to bed at "normal" hours. Here's to a new year of reading and books! I went and saw We Bought A Zoo and i liked it and the music too. I'll have to check it out more. I started reading Inheritance again, I was afraid I was going to forget everything. I hope you make it through this stressful week. I cleaned up my Christmas stuff yesterday and it feels good. Early church throws me for a month or two, then I usually get into a new groove. I do love your Sunday Salon. It's a cool glimpse of life in your corner of the world. Enjoy a safe New Year's Day. so after Jonsi, you must give sigur ros a listen (maybe pick up the documentary (?) Heima) It is Jonsi (but better? ).--had no idea he did this soundtrack--nice. I hear you about the Doctor switch. don't know about Once Upon a Time, when does that start back up. was bummed to hear I may have to wait on PBS and May to see the new season of Sherlock (which aired on BBC yesterday)--sigh. hope you and the family have a good first week of 2012. Jenny: Well, this other Doctor is very much loved too, so I'm guessing he grows on you! I haven't started Inheritance again. Need to. Inside: I'm glad you like these posts. Sometimes I feel they may be just a bit TOO much personal or something. I don't know. Good luck with the clearing up Christmas! I will do the decor tomorrow.. I think. L: I had heard of Sigur Ros before this, but hadn't listened much to them. And I will be do just as you suggest. Very interesting sound that's for sure. I guess Jonsi was their guy and then broke off on his own. In case you haven't watched it yet, I'll make it a little easier for you: "The Next Doctor" isn't actually the episode where the next Doctor comes in. Confused now :-)? For the record, Eleven has grown on me, but Ten is my Doctor.